↑ "Official Documents to be in Mongolian Script". UB Post. June 21, 2011. ओरिजनल से November 1, 2011 के पुरालेखित. पहुँचतिथी 2010-07-11. ↑ 2.0 2.1 "Mongolia". World Factbook. CIA. पहुँचतिथी August 9, 2015. ↑ "National Statistical Office of Mongolia". NSO.MN. ↑ "Gini Index". World Bank. पहुँचतिथी मार्च 2, 2011. ↑ "2015 Human Development Report Statistical Annex" (PDF). United Nations Development Programme. 2015. प. 9. पहुँचतिथी December 14, 2015. 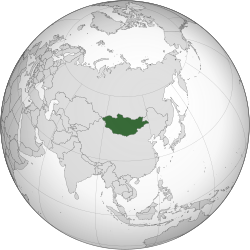 ↑ "Mongolia Standard Time is GMT (UTC) +8, some areas of Mongolia use GMT (UTC) +7". Time Temperature.com. पहुँचतिथी 2007-09-30. ↑ "Clock changes in Ulaanbaatar, Mongolia". timeanddate.com. पहुँचतिथी 2015-03-27.